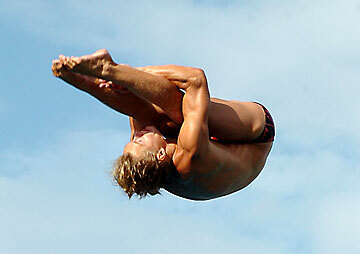 Hawaii's Magnus Frick placed second in 1-meter diving at the NCAA Championships. Hawaii diver Magnus Frick placed second in the 1-meter springboard diving event yesterday at the NCAA Men's Swimming and Diving Championships at Minneapolis. Frick was the highest finisher in the preliminary rounds and completed the meet with 395.05 points, 4.30 points behind winner Terry Horner of Florida State. UH's Mats Wiktorsson placed 20th in the preliminaries with a score of 298.60. Frick and Wiktorsson will compete in the 3-meter springboard today. Wiktorsson is also scheduled to compete in platform diving tomorrow. Stanford senior Hongzhe Sun (Iolani '03) finished ninth in the 200-yard individual medley. Sun was timed in 1 minute, 44.60 seconds. He also was on the Cardinal's 400 medley relay team that was disqualified. Randall Tom (Seabury Hall '04) was part of the UC Irvine 400 medley relay team that placed 14th in 3:11.69. Mark Eckert (Iolani '04), a junior at California, finished 25th in the 200 IM in 1:47.18. Services for Thomas Kaulukukui Sr. will be held Tuesday at the Church of Jesus Christ of Latter-day Saints' Kaneohe Stake Center. Visitation will be from 8:30 to 10:45 a.m, with the service from 11 a.m. to noon., and a private burial to follow. Kaulukukui, the University of Hawaii's first football All-American and a member of the UH Circle of Honor and Hawaii Sports Hall of Fame, died on March 9. In lieu of flowers, donations may be made to the Thomas K. Kaulukukui Scholarship Fund, c/o University Foundation, at P.O. Box 11270, Honolulu, HI, 96828, or online at uhf.hawaii.edu. The Brigham Young-Hawaii softball team swept a doubleheader against Claremont Mudd yesterday in Laie. Rachelle Wade and Jana Dewey hit home runs in the Seasiders' 8-0 win in the first game. Agesha Lightsy homered in the second game, a 7-2 BYUH win. » The Hawaii-Hilo softball team moved up five places to No. 11 in this week's National Fastpitch Coaches Association NCAA Division II poll. The Vulcans are 22-2 and are on a 15-game winning streak. The Brigham Young-Hawaii women's tennis team remained undefeated with a 6-0 win over Dixie State yesterday. The Seasiders dropped just one game in sweeping the six singles matches. Chaminade won its first match since 2005 with a 7-2 win over Dixie State. The Silverswords got singles wins from Audra Takara, Tiffany Divincent, Joelle Tanaka, Kevahi Leong and Ona Byers, and the team also took two doubles matches. Chaminade improved to 1-9. The Hawaii-Hilo men's team swept Northwestern (Minn.) College 9-0, and the Vulcans women's team scored an 8-0 win over Northwestern. Hawaii Speed and Quickness will hold clinics tomorrow and Sunday at the University of Hawaii campus. The clinics are open to students from kindergarten through eighth grade. The cost is $10 (cash only). Registration starts at 7:30 a.m. at Klum Gym. Information is available by calling 739-5444 and online at HawaiiSpeedandQuickness.com.